A4 Quest is an adventure game in which you will face countless monsters while going through consecutive locations. Your goal will be to complete specific tasks or just to stay alive! As its name implies, each quest will fit on one A4 sheet, which can be printed so that you can enjoy the game right away! All you need is to pick your hero, arrange a few d6 dice and you are ready to go! The whole thing does not require cutting, you can play directly on the printed sheet, although feel free to split it so that it can fit in your pocket. 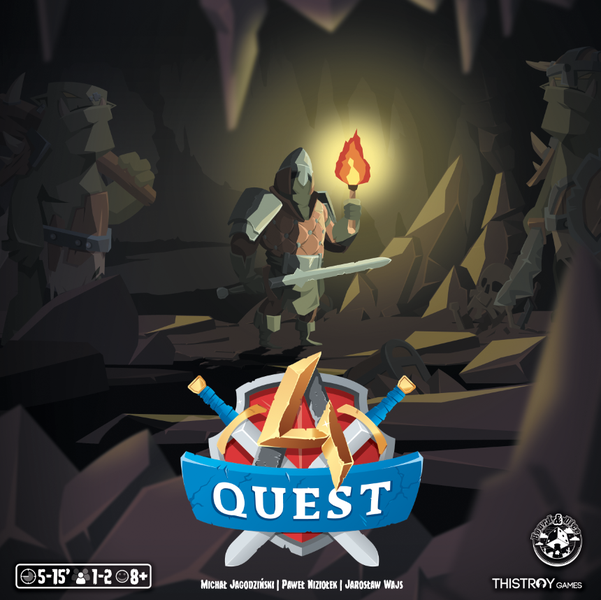 Mobility, the possibility to mix the sets, adventures, rooms, and game time under 10 minutes are the main assets of A4 Quest. You have a break at work? You’re riding on a train? All you need is a bit of space and you can start your adventure and put your opponents to the sword! The whole game has a humorous graphic design and its style resembles a two-dimension platform games known from computers or mobile games. Manage your dices by assigning them to right adventures. Choose from available actions on the field. But remember, you need to plan a few steps ahead! Arrange food so that you can rest, because if you don’t your hero will bite the dust sooner than you think! Also, remember about your hero’s special skills because they might save you more than once!